The Canon PC-150 is a printer/copier which is certainly worth considering because, even though many of you will have perhaps overlooked the Canon name in favour of other emerging brands, the PC150 laser printer has plenty to offer. We take a closer look to examine why the Canon PC-150 has achieved an excellent reputation during its time on the market . The Canon Personal Copier 150 features a smart folding design making it the perfect portable copier. A convenient pop-up handle ensures that you can carry the PC150 copier on public transport, take it to meetings and travel around lightly . This small, compact and easy to operate machine includes some bold lines and a simple yet pleasing off grey finish. In a functional sense, though small, the Canon PC-150 seems to be very hard wearing. It certainly handled our tests with stability. As previously stated, the Canon PC-150 is a touch little item and one which shouldn't cost you an arm and a leg in order to purchase. Simplicity is key to the success of the Canon PC-150 and the machine itself is lacking in unnecessary buttons and dials, leaving it simple and slightly retro looking in all honesty. 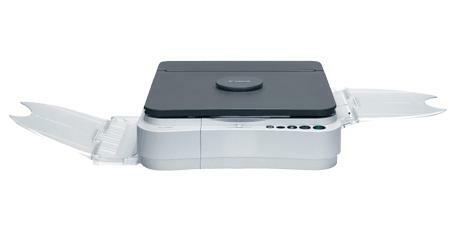 As the Canon PC150 requires no warm up time copying is convenient and instant. An adjustable exposure slide demonstrates Canon's commitment to giving the user more control over print settings. Moreover, the single cartridge system makes the PC150 personal copier an easy and affordable device to operate and maintain. It must be said, the Canon PC-150 is not a new machine by any means but it is one which has stood the test of time very admirably. As such, you too could certainly benefit from having a Canon PC 150 printer in your current set up as it works in a sturdy and reliable fashion time after time.